The State of Connecticut has a helpful tourist information office, and each city and town has a Chamber of Commerce or other local tourist office. Contact the Connecticut Commission on Culture & Tourism, One Financial Plaza, 755 Main Street, Hartford CT 06103 (tel toll-free 1-888-288-4748) for a copy of their free Connecticut Vacation Guide. 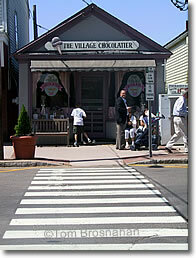 The Village Chocolatier, Guilford CT.